Why is Manmohan's Sri Sri connection important for White House? Sri Srinivasan may become the first Asian American to be nominated to US Supreme Court following the vacancy created by Justice Antonin Scalia's death. While spiritual leader Sri Sri is hogging the headlines in India, in a faraway land another Sri Sri is making news, and could also end up creating a little bit of history. Unlike the Sri Sri of ‘Art of Living’ fame, this Sri Sri is somehow connected to former Prime Minister Manmohan Singh. Puns apart, unlike Sri Sri of Art of Living; he prefers to be known by a singular "Sri", though his full name Sri Srinivasan could easily be abbreviated as "Sri Sri". Meet Sri, who could become the first Asian American to bag a nomination from the White House to the US Supreme Court following the vacancy created by the death of Justice Antonin Scalia. Sri, along with Merrick Garland and Paul Watford are the leading contenders for the Supreme Court. Earlier in 2013, following his nomination by President Obama to the US Courts of Appeal for the District of Columbia Circuit, he won by a vote of 97-0, leading to speculation that President Obama could nominate him for the US Supreme Court. What is equally interesting is the Sri family connection with former Prime Minister Manmohan Singh. Now how could a family from Tamil Nadu hailing from village Melathiruvenkatanathapuram near Tirunelveli, get to know Manmohan Singh? 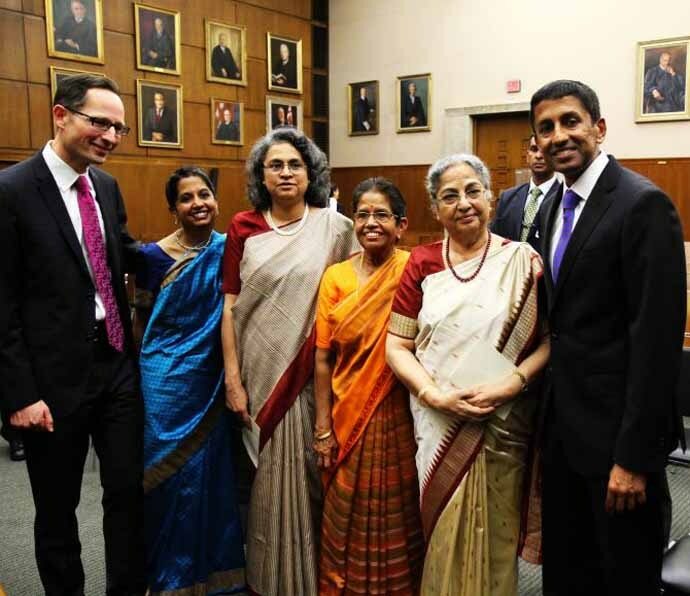 In 2013, when Sri took oath in the US Courts of Appeal (Courts of Appeal are often referred to as the second most powerful court after the Supreme Court), in attendance were family members of the Indian prime minister. Both wife Gursharan Kaur, and daughters Upinder Singh and Amrit Singh joined the ceremony, with Gursharan Kaur literally driving from the airport to be in time for Sri’s oath-taking ceremony. Sri added: “I know today, it’s a very special day to you and your household and so, I want to extend to the prime minister, a very happy birthday from all of us!” (The day was 26 September 2013, the birthday of Manmohan Singh).